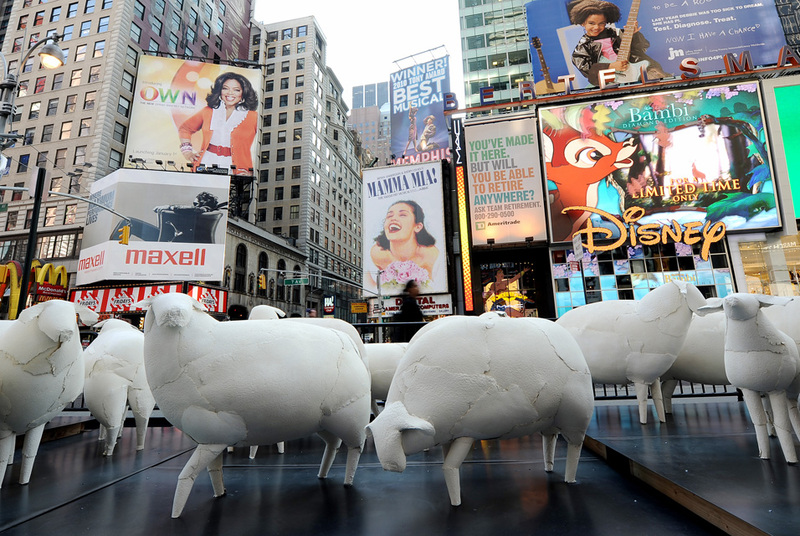 A view of the art installation 'Counting Sheep', by artist Kyu Seok Oh, in Times Square in New York, New York, USA, 02 March 2011. The sheep, which are handmade of heavy paper, are part of a small, temporary sculpture installation in Times Square to promote an area art show and will be on display until 07 March 2011. EPA/JUSTIN LANE. TIMES SQUARE, NY.- As part of an ongoing commitment to bring the best of contemporary art to Times Square, the Times Square Alliance presents a major public art exhibition at the Crossroads of the World as part of Armory Arts Week. The Times Square Show 2011, comprised of five whimsical and thought-provoking world-class sculptures, began on Tuesday, March 1. The outdoor exhibition features four sculptures presented in partnership with the Armory Art Show -- artists include: Tom Otterness, Niki de Saint Phalle, Grimanesa Amorós, David Kennedy Cutler -- and a site specific installation by Kyu Seok Oh, produced in collaboration with the West Harlem Arts Fund. New Yorkers and visitors can view all the sculptures from Tuesday, March 1 to Monday, March 7 in Times Square. The first four installations are at Duffy Square and the Broadway Plazas between 46th Street and 47th Street. The 24 paper sheep by Kyu Seok Oh are exhibited on the Broadway Plazas between 45th Street and 46th Street near the Marriott Marquis Hotel. Pirate Henry Morgan's Cannons Found in Panama?